To become a traffic policewoman in Pyongyang, candidates need to be single, between 16 and 26, pretty, at least 165 cm tall, and have at least high school diploma, Chinese media reported Saturday. 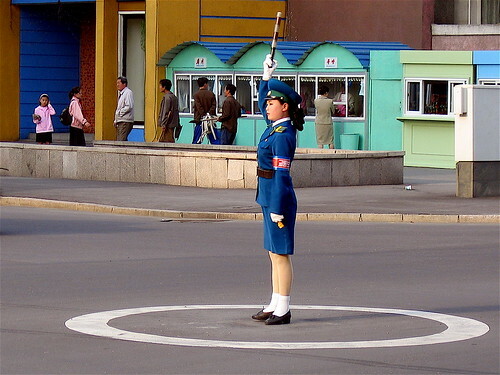 A North Korean policewoman stands in a thoroughfare in Pyongyang. 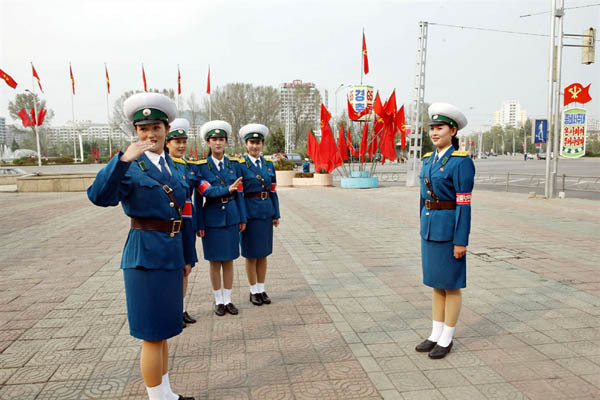 One Chinese paper claimed Pyongyang’s beautiful female traffic police are “known globally” for their efficient smoothing of the traffic flow on major roads in Pyongyang. They are dressed in a blue uniform and hat to be easily noticeable. In winter they wear fur collars and in summer a white shirt. Traffic police wave white batons at night because a shortage of electricity forces the country to turn off the street lights at night. There are some 50 traffic watchtowers on major roads in Pyongyang for hand signaling, and about six female officers are assigned to each post. They work in shifts from 7 a.m. to 10 p.m., or about three hours per shift. As part of their compensation, the North Korean regime gives them special treatment by letting them choose where they wish to work or pursue further studies after six to seven years of service. In Pyongyang, attractive young policewomen wearing characteristic uniforms with peaked caps, white jackets, and royal blue skirts are a common sight in many traffic intersections. These officers, bearing whistles and batons, are known for dutifully directing passing vehicles with discipline and brisk efficiency. Any foreigner who visits North Korea is sure to see these classic icons in the capital city. However, there is more to the story. There are areas in Pyongyang where riding bicycles is forbidden. The purpose of these no-ride zones is to keep the cityscape clean, orderly, and aesthetically pleasing - indispensible elements for the showcase capital. Yet, for ordinary citizens, the bicycle serves as a vital means for daily transportation. As a result, precarious games of cat-and-mouse between the traffic police and citizens regularly ensue in these areas. Our North Korean undercover reporter Gu Gwang-ho has captured images of these incidents with his hidden camera on a typical day in the Taedonggang District of Pyongyang. The Democratic People’s Republic of Korea (DPRK) may have a few things to be proud of, its female traffic police officers as fashion icons in the country are one of them. Chang-jeon Outpost in Pyongyang, capital of the DPRK is staffed by six female traffic police officers. Their captain Roh Young-mi is 25 years old and has served there for eight years. She was just promoted to outpost chief last year. With the Okryu Bridge in the east, the Mansudae Congress Hall in the west, the bronze statues of Kim Il-sung and Kim Jung-il in the north and the Kim Il-sung Square in the south, the outpost, in downtown Pyongyang, commands vital traffic routes. 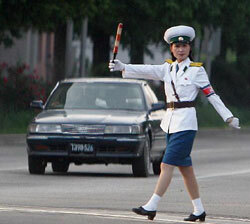 Pyongyang female traffic police officers must be taller than 163 centimeters, in good shape and appearance. They are smart, healthy, excellent both in conducting and learning, and gifted in many ways. Every year about 30 girls graduated from high school and aged above 16 are selected to be traffic police. In 2004, Roh became a traffic policeofficer at 16. “On the day I was enlisted, I came home with a pack of police uniforms in my arms, and this made my parents cry; that was true, they burst into tears. They could hardly afford me a whole outfit from head to toe, but we had the uniforms for each season,” said Roh. Before 2010, there were a few traffic lights in Pyongyang, and traffic was controlled by female traffic police officers. For safety purposes, pedestrians were required to cross the streets through underground passages. “Everyone abides by the traffic rules. For those few who violate the rules, we will educate them. In this way, everyone will obey the traffic rules. It’s a serious matter,” said Roh. Now, traffic lights are installed at many junctions in Pyongyang. Two years ago, the junction Roh serves at also installed traffic lights. Now the main task for female traffic police officers is to maintain order at junctions and roadsides. But when a blackout or a traffic light failure happens, Roh has to control traffic. “Our leader once taught us that a traffic police officer must be swifter than others because this post is very important. Frankly, traffic police often get suntanned in summer and get their hands and feet frostbitten in winter,” said Roh. Some joke that it is the beauty of the female traffic police officers that makes the drivers slow down and even halt their vehicles for a look, thus reducing road accidents. “Men drivers will look at us when they pass the junction. They say that we are beautiful, and we will feel happy,” said Roh. Pyongyang female traffic police officers have to leave their posts when they get married. Even if they remain single, they will not be allowed to work after 26. For Roh, she is able to work for only two more years. Roh said that she hates to take off her uniform; and even though she will one day no longer work as a traffic police officer, she hopes that she can still remain in the police force. With more traffic lights installed in Pyongyang, half of the over 300 female traffic police officers have stepped down from their posts. After their service terms are completed, they can further their studies or get other jobs. 북한은 몇 가지 자랑거리를 가지고 있을 수도 있다. 그 중 하나가 패션 아이콘으로서 여성 교통경찰이다. 북한의 수도 평양 창전지구를 담당하는 여성 교통경찰은 6명. 조장인 노영미 씨(25)는 8년째 이 일을 하고 있다. 그는 지난 해 조장으로 승진했다. 동쪽에 옥류교, 서쪽에 만수대 의사당, 북쪽에 김일성 김정일 부자 동상, 남쪽에 김일성 광장이 자리한 평양 중심지 창전지구는 가장 중요한 교통로이다. 평양의 여성 교통경찰은 키 163cm 이상에 몸매와 외모가 뛰어나야 한다. 이들은 똑똑하고 건강하며 우수한 지휘능력과 학식 그리고 여러 방면에서 능력을 갖춰야 한다. 매년 고교를 졸업한 16세 이상 여성 가운데 약 30명을 교통경찰로 선발한다. 노영미 씨는 16세이던 2004년 선발됐다. "군복(경찰복)을 한 아름 안고 (집에) 들어갔더니 부모님이 울었습니다. 정말 울었습니다.친부모도 머리부터 발끝까지 옷을 사철 못 해주지만 우린 철마다 새옷이 나옵니다. "노 씨가 말했다. 2010년 전에는 평양에 교통신호등이 많지 않아 여성 교통경찰이 차량흐름을 통제했다. 안전을 위해 보행자들은 지하도로 길을 건너야 했다. "누구나 다 교통법규를 지킵니다. 위반자가 없습니다. 설사 위반을 했다고 하더라도 고쳐야 한다고 알려주면 누구나 다 지켜줍니다." 노 씨의 설명이다. 이제 평양의 많은 교차로에 교통신호등이 설치됐다. 2년 전, 노 씨의 근무지에도 신호등이 생겼다. 현재 여성 교통경찰의 주된 임무는 교차로와 길가의 질서 유지이다. 하지만 정전이나 신호등이 고장이 났을 때 차량흐름을 통제한다. "교통경찰은 그 누구보다 신속해야 한다고 배웠습니다. 이곳은 매우 중요한 곳이기 때문이지요. 솔직히 말해 교통경찰은 여름에 햇볕에 그을리고 겨울에 손과 발에 동상에 걸리는 일이 종종 있습니다." 일부 운전자들은 여성 교통 경찰관들에게 예쁘다고 말을 건네기 위해 차량 속도를 늦추거나 아예 차를 세우고 쳐다본다. 그 덕에 도로 교통 사고는 줄어든다. "남성 운전자들은 교차로를 지날 때 우리를 봅니다. 우리에게 멋있다고 합니다. 기분좋습니다." 노 씨가 웃으며 말했다. 평양의 여성 교통 경찰은 결혼하게 되면 근무지를 떠나야 한다. 설령 결혼하지 않더라도 26세 이후에는 이곳에서 근무가 허락되지 않는다. 노 씨도 이제 2년 정도 남았다. 노 씨는 유니폼을 벗기 싫다고 말한다. 비록 더는 교통경찰 업무를 볼 수 없게 될 날이 오더라도 계속 경찰에 남고 싶어한다. 평양에 더 많은 교통신호등이 설치되는 가운데 여성 교통경찰 300여 명 중 절반이 근무지를 떠났다. 여성 교통경찰은 정해진 근무기간을 채운 후 공부를 더 하거나 다른 직업을 구할 수 있다. North Korea may be a totalitarian hellhole run by a lunatic with an affinity for women’s M.C. Hammer glasses, but we’ll at least give Dear Leader this: his army of traffic-control maidens is a sight to behold. Stationed at intersections throughout Pyongyang, the uniformed women of the city’s traffic police go about their mission with robotic precision. It comes off as a deadly serious affair – no smiling, no banter – as they point what little traffic there is in the direction it needs to go. And, really, it is serious business: After all, even though there may be traffic lights, there’s little electricity available to power them. As such, the burden of maintaining order on the roads falls on the shoulders of these often pretty, yet always stern-faced officials. As one oblivious Mini Cooper driver learns in one of the videos posted after the jump (how does one come to own a Mini in NoKo, anyway? ), you can get the traffic girls to leave their posts, which are defined by circles drawn in the intersections, if you ignore their instructions. Only they won’t do so until after they complete a formal, choreographed changing of the guard ceremony. Other observations: in the summer, the blue uniform tops appear to be exchanged for white ones, and the traffic-control stations (at least some of them) are augmented with shaded platforms that presumably make the job somewhat more bearable. It’s all bizarrely fascinating to watch, which you can do in several videos posted after the break. The scenery of the beautiful ladies of Pyongyang. Female traffic police throughout the year there are three sets of uniforms, summer is white and blue skirts, spring and autumn are blue in blue dress, winter is blue blue pants, cold weather also has fur-lined boots. In addition, the State also offers cosmetics for ladies free, from primary care to makeup, is North Korea's best brand "spring fragrance". It is said that North Korea's supreme leader Kim Jong-Il, the late ladies ' are concerned, personally instructed, on a hot summer day to every female traffic police issued sunglasses to protect their eyes.